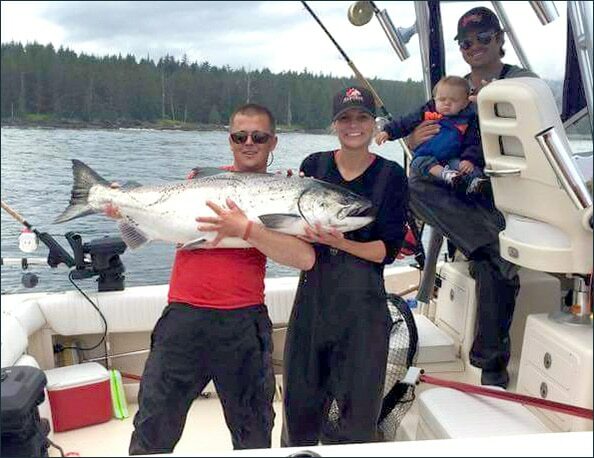 Lucky for us the fantastic fishing achievements of July continue to roll in! It’s almost a new surprise every day! Through a real mixed bag of weather conditions this past week QCL guests have found exciting fishing all over the grounds. The current hot spot… Mazzaredo Islands! We generally drive right by these quiet little kelp beds on our way to the Bird Rocks or Klashwun Point. Historically we fish them when the seas further out are a little too lumpy. But they always hold fish and those who decide to spend some time there are often well rewarded! We’ve seen a lot of fish taken there this week with some giants in the mix. Fishing with guide Kingsley (Panda) Bryce, Henri A. brought a big beauty to the boat Monday, taping it out to 46 pounds before carefully releasing it. Driftwood guest Tim A. landed another huge Chinook that tipped the scale at 46 pounds and there were a couple of others in the 30’s caught on Tuesday. But these large fish weren’t confined to the Mazz, with several Tyees taken throughout the grounds. Perennial Driftwood guest Jim S. and his son started off their trip Monday with Scott boating a magnificent 48 pounder! 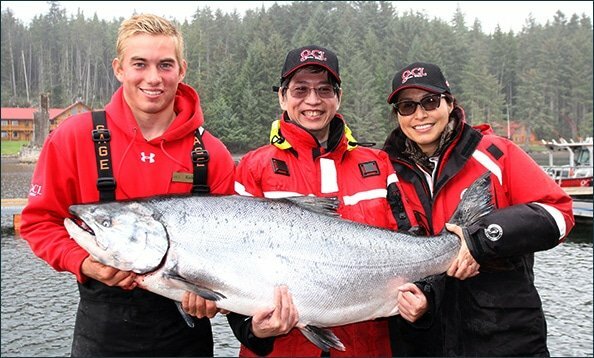 And on Tuesday 10-year old Henry P., fishing with his father Scott and guide Oliver Schmaler, did a fantastic job of playing a huge Chinook to the boat that tipped the scale at 40 pounds! 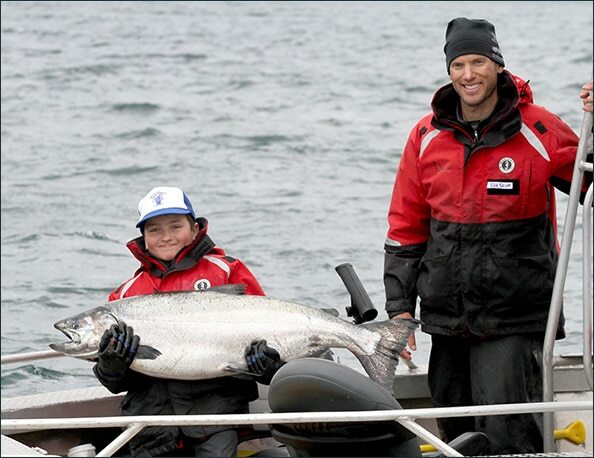 Great fish Henry, we’re sure your Grandpa Herb is very proud of you! We always hope to see some fish in the “extreme” category and on Monday California angler Neilson T. and his wife Jane were fishing with guide Kashes Redfern at Parker Point. Nielson’s first fish of the trip took a whole herring off the back rod at 10 pulls just seconds into their tack. It was a tough battle but on Monday night at the Bell Ringer, his 64 pound Chinook got quite a lot of attention! What a magnificent fish! Halibut fishing this past week has been exceptional with lots of nice fish coming to the boat. Several fish in the 30 to 70 pound class were taken and we found quite a number of big ones out there! Mark M released a 100 pounder, Bryan H a 141, Robert D a 163 and Jonathan B with Colin R teaming up to land a 180 pound halibut! And guide Matt Brown kept his guests busy on Sunday – Dale J reeling up not one, not two, but 3 halibut over 100 pounds! What a workout! Dale’s fish taped out to 103, 109 and 142 pounds! Talk about a sweet spot – they seem to have found one! Looking ahead to this weekend the tides will moderate to only about a 7 foot change and we’re expecting only light variable winds after a little south to southeasterly kick on Friday. Your lodge must do a better job at promoting catch and release. Those big salmon are precious. A 40 pound salmon is 1 in 500,000 . a 50 pound salmon is 1in 5,000,000. and a 60 pound (plus) salmon the ratio is so small it is immeasurable . Its awful to watch them being slaughtered for the sake of ringing a bell. Trip #18 proved to be an EPIC trip… besides my 46 pounder, Jim Hunter, a newbee to QCL caught a 46 pound Ling Cod and hooked a 42 pounder “catch and release” in the last half hour of the trip for a perfect ending to a perfect trip…!!! I will be there the 17th aug with my two girls can,t wait!! !